Thirteen of Charles Darwin University’s top Indigenous students are being employed by the university to champion the benefits of study to their peers. The program started this month in Darwin and has just expanded to the Alice Springs campus. Alice Springs students Jessica Laruffa, Brooke Wheeler and Jessica Procak have joined nine Darwin-based ambassadors who are keen to see more Indigenous people inspired to study. Bachelor of Education student Jessica Laruffa signed up to the program earlier this year and also works part-time for the Northern Territory Government. She said she looked forward to telling others about her educational journey and the support and assistance on offer to prospective Indigenous students. “It’s about giving something back to the local community and showing students the many channels of resources and help available through CDU and the NT Department of Education and Training,” she said. At just 19 years old, Jessica Procak is blazing through her final year of a commerce degree and is keen to tell her story to other young students. “All of my mates in Year 10 wanted to complete apprenticeships, but I wanted to do more so I set my sights on university,” she said. With great support from her teachers at the Centralian Senior Secondary College and CDU, Jessica said she made an easy transition from high school to university. “I’m really keen to show other young people that university is achievable and there are many people and programs at CDU that can help Indigenous people get into university,” she said. “No one told me to go to university. I made that decision myself, but I am very keen to tell my story to other young people who think they can’t do it,” she said. Busy mother Brooke Wheeler is completing her Bachelor of Nursing and is working two days a week at the Alice Springs Hospital. Her study journey started as a receptionist at the local community health centre. “I was working in reception at community health and thought to myself ‘there has to be something more I can do’ and from there I approached CDU,” she said. “Looking back now, I wish I studied much earlier and I want to talk about this to students,” she said. A Senior Academic Support Lecturer at CDU, Cheri Williams , said all three students would be a powerful inspiration to other Indigenous students. 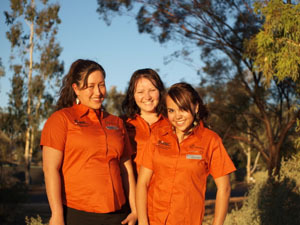 “These three high-achieving ladies are living proof that higher education is achievable to students across Central Australia and we are grateful to have them as part of our team,” she said.